Bess arrived on Monday 22nd September 2014. 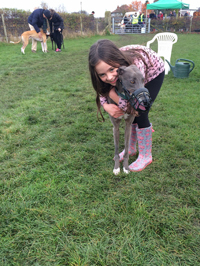 Went to her new home on Tuesday 28th October 2014. 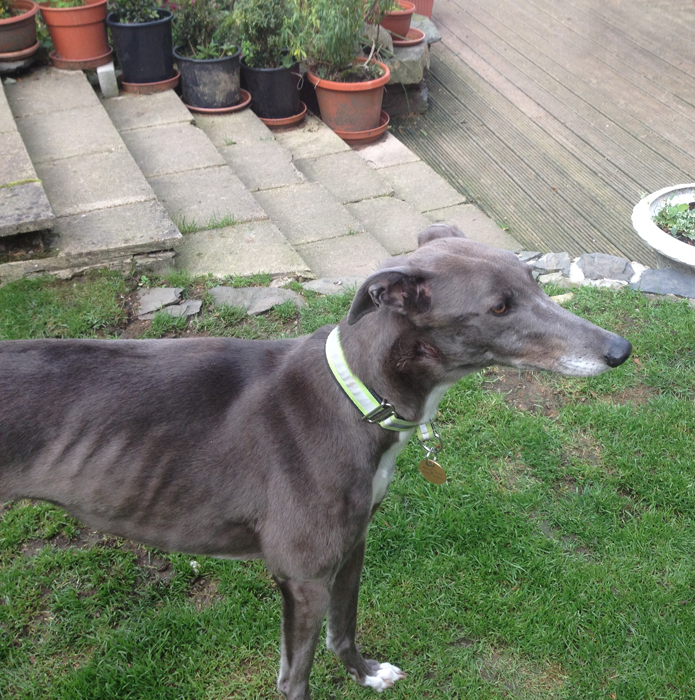 Bess is a pretty blue ex-racing greyhound who weighs 25k. 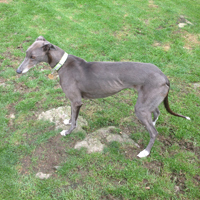 Just 3 years old she came into 'rescue' because although very good on the track she decided she didn't want to race anymore and would no long come out of the trap when the race started. Apparently she'd won a lot of races before she realised she didn't have to do it anymore and simply walked from the trap wagging her tail. Even after additional schooling she still refused, so here she is!! Bess is now house trained, spayed, microchipped and inoculated. 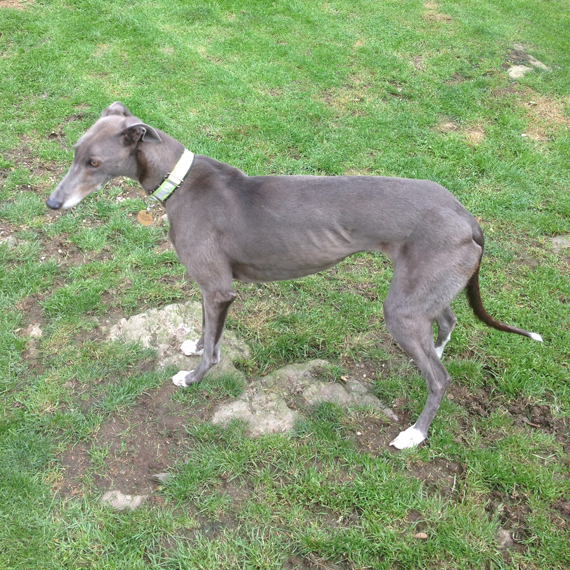 She is a friendly girl who was previously kennelled with a lurcher and who appears to be okay with other breeds of dogs. 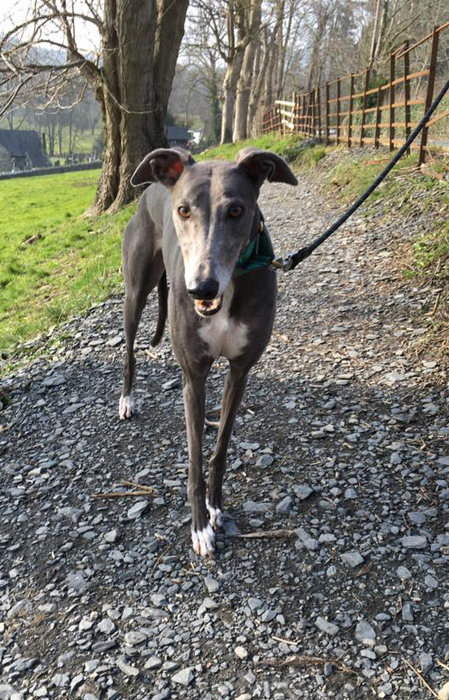 She walks nicely on the lead and travels well in a car. * The branch kennel at the bottom of our garden is where Bess and the other resident(s) will be for the first day or so until she gets to know the other greyhounds. She has use of our garden and paddock, and once she gets to know the other dogs she will be allowed in the house during the day and all the dogs will then take it in turn to sleep in the house at night, so they become use to sleeping in both the kennel and the house. Bess arrived this afternoon and because I hadn't finished changing the rooms in our bed and breakfast I put her in one of the kennel sections so I could get finished. 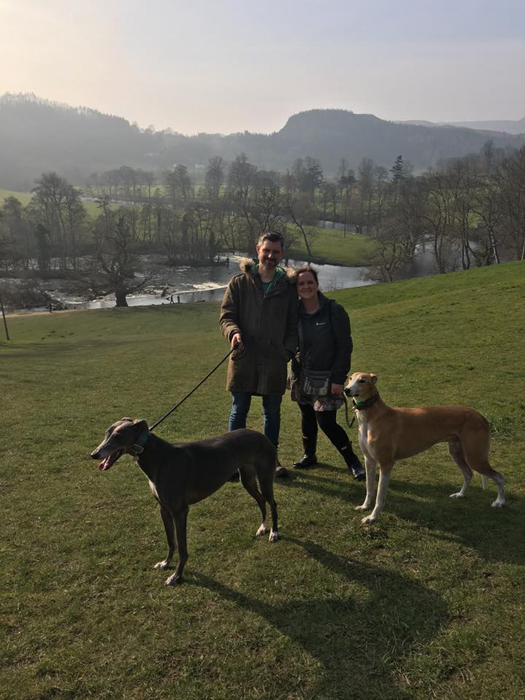 Being in one of the kennel sections meant the other greyhounds could come in and say hello. When I finished my work I popped a muzzle on her because she became a bit grumpy with the others wanting to sniff around her, which some females are prone to if they feel a little vulnerable. We reduced the numbers, kept her muzzle on her and let her explore the garden, then brought her in the house to feed her. Having tried to get the food from the dish while still on the work top she was told to get down, her food put in the raised feeding bowl, and having gobbled it down she then tried stealing from one of the other bowls while the dog was still eating. Not allowed Bess so she was escorted to the garden, her muzzle popped back on and told to go and do her toilet. 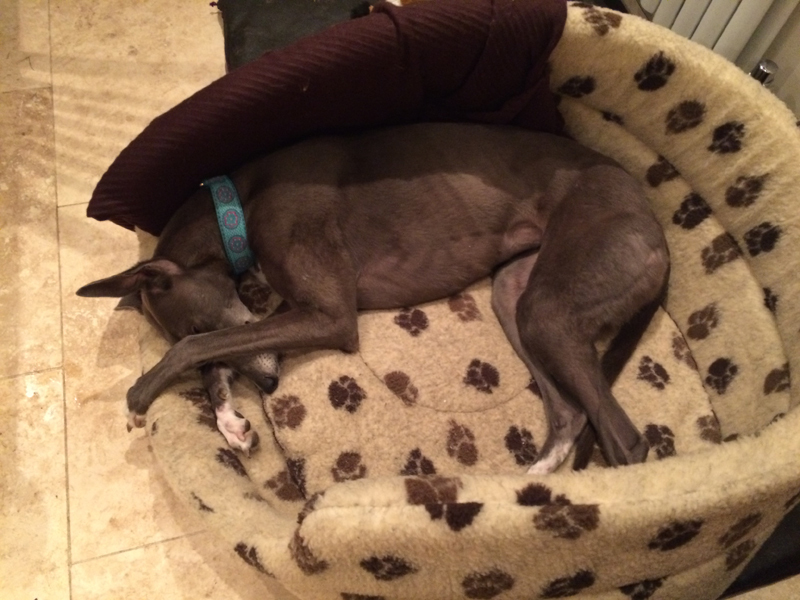 Last night Bess slept in one of the kennel sections with 3 other dogs sharing the rest. All was fine in the night, no accidents and a lovely greeting this morning, but still a little grumbly to the others. Bess is getting used to being around all the other greyhounds now and is no longer grumbly towards them - unless they push her, then she remindss them of their manners. After the first day of being here she's been in and out the house during the day and sleeping in the kennel at night. This morning Bess took a trip to the vet where she was spayed and had her first inoculation because she arrived here with no paperwork. All went well with the spay and we collected her in the afternoon and brought her home. A little sleepy she slept in the kitchen in front of the fire until she realised she was hungry and came asking for food, which she really enjoyed. All the dogs slept in the house this evening including Bess so we could keep an eye on her. Bess had a good night in the house last night and this morning she is looking better and a lot happier, not too sure of the bed and breakfast routine when she has to stay behind the kitchen gate until all the breakfast things have been cleared away, but she will soon get used to that. 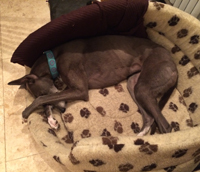 Bess has settled in well here and is happy to sleep in the kennel at night or in the house. Must admit she prefers the house, but if when out for her last toilet we say 'kennel' she happily runs to it and settles in one of the beds inside. 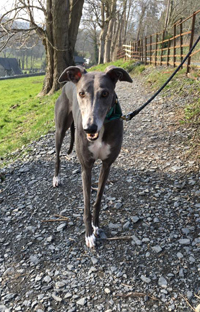 Bess is a really pretty girl, a bit grumpy with the others when she first arrived, but being put amongst another 10 greyhounds it's not surprising. After a couple of days she settled, having found her position within the pack. She's in and out the house during the day and at night she's sometimes in the house and sometimes in the kennel as they all take turns. She's been spayed, is having her stitches out tomorrow and is having her second inoculation this week sometime. She walks nicely on the lead, is a happy girl, still a bit of a thief when the opportunity arises and hasn't quite got the message yet that once she's eaten all her food she does NOT dive into another dish to pinch that as well. However, they all try that one and in time they all learn I will not allow it. It's a case of their dish and their dish only here. She's been in our local pub, which she took in her stride and was greatly admired by all who came over to say hello to her. When we've left her in the house with the others while we are out she's shown no signs of anxiety and she's shown no signs of aggression to any of the dog guests staying in our b&b, although she's not been nose to nose she's been close to them looking through the gate or balcony fence. 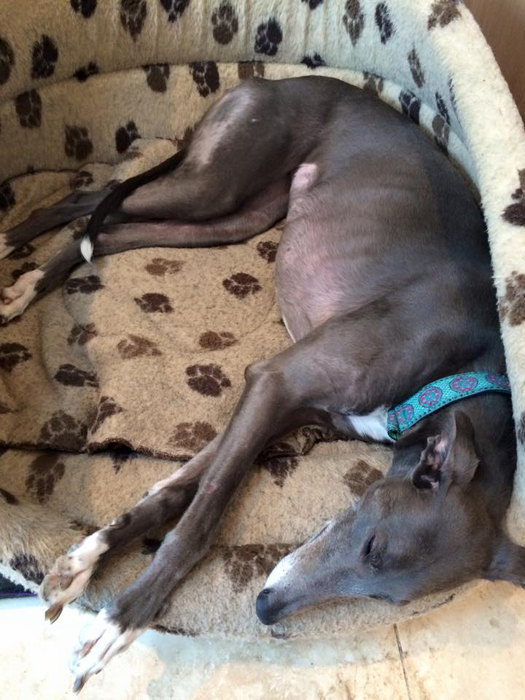 This afternoon Bess went to the vets for her 2nd inoculation and have her stitches removed. There were a number of dogs in the waiting room and Bess ignored them all. We took Bess back to the vets this afternoon following her need for stitches in her front right leg when she never got out the way quick enough when Toby decided to put Nero in his place. 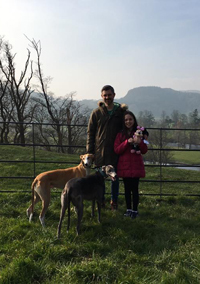 We think resulting from Carly, Lizzy and Purdie all being rehomed a couple of days earlier leaving just Bess. We are only guessing at this because all seemed well with the 'pack' right up to the point of the altercation. She weighed in at 24.94k. All the stitches were healing very well except the one at the very top, which he thought might breakdown because he said the skin was ragged there. He's put some antirobe and gel on then re-dressed it saying he wants to see her next Monday morning. If it's drawing together and healing okay all will be well, if not, then he says the edges will have healed enough to put another stitch in it, which he will do. 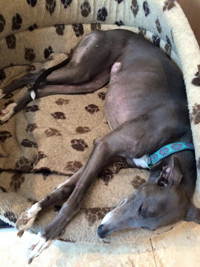 We will know Monday morning whether they are keeping her in to re-stitch or if all is okay for he to be re-homed. He wants to make certain she is okay before he 'signs' her off. 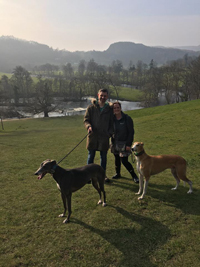 This afternoon Bess went off with her new owners to her new home where we hope she will have a long and happy life with her new family. We heard this evening that Bess is settling in well. Frank their other greyhound is still being a bit grumpy with her when she approaches him on the settee or near his bed, and often it's first thing in the morning, but Bess just turns and walks away from him. 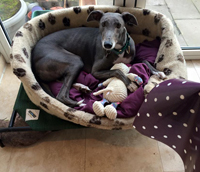 Things appear to be improving on a daily basis and today or last night Bess and Frank were seen sharing a bed together, not touching each other, but sharing the same bed, which is good step forward. They walk nicely together and lots of other things they are fine about, but Frank will still put her in her place if he feels the need for it. As a result, both dogs are being muzzled at the moment when their owners are out - just to be on the safe side! 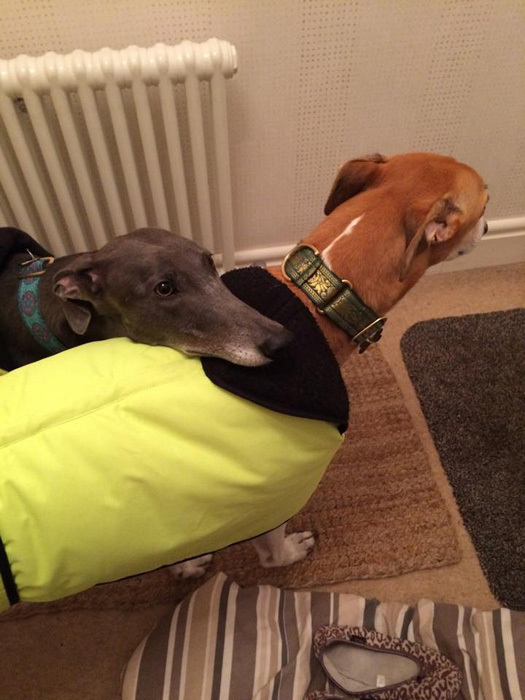 There have been a few fireworks going off tonight and although Frank doesn't like them Bess doesn't bother with them. We heard today that Bess is doing well and seems settled. 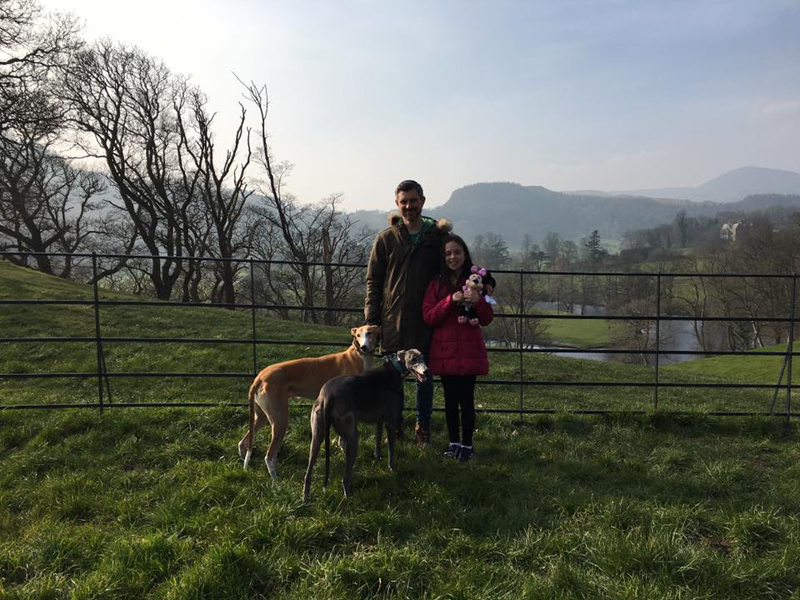 Her new owner says there is still the odd grumble from Frank, but they think he’s realised that she too lives with them now. 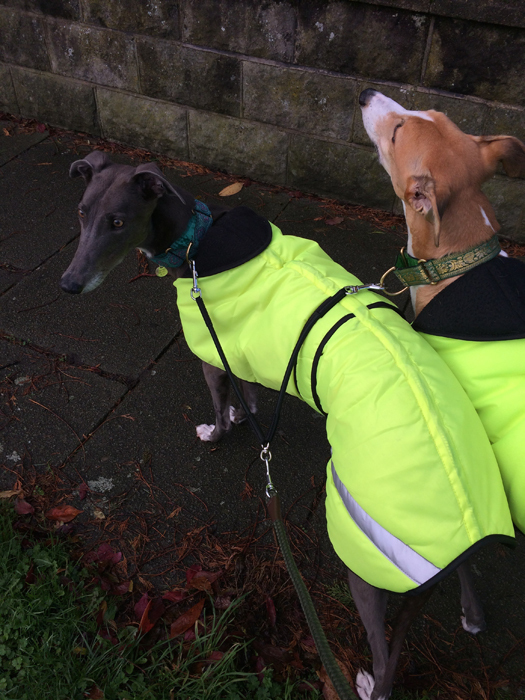 They’re both off to an RGT greyhound playgroup on Sunday afternoon, so it will be interesting to see how they both get on there with all the others. Have a good time the pair of you! We heard today that Bess is continuing to do well. She’s such a sweetie and quite a character. Frank’s okay too although unfortunately one of the children accidentally shut his tail in the porch door two weeks ago resulting in a fracture and a split which we are currently back and forth to the vets with as they try to save the end of his tail. He did have it unbandaged for a week but then it started bleeding quite a lot again and so currently he’s got a rather fetching tiger stripe bandage on! Back again tomorrow when it will either be re-bandaged or protected with pipe lagging. Bess has a corn but her new owners are treating that and she seems more comfortable now. They’ve also bought a boot for her. Frank and Bess are getting along together fairly well now and actually miss each other when the other isn’t there (which has happened a bit with five trips to the vets in two weeks). Frank does still keep Bess in check from time to time and it’s obvious he’s telling her off when she chases around the perimeter of the chicken coop (something which she will still try to do at every opportunity, despite dousings with cold water). Bess still doesn’t try to get on the sofa though but she has found her own comfy spots on the lounge rug or on the folded quilt in the hallway. Frank and Bess use each other’s dog beds and you can never be sure who you will find where, although when it’s treat or dentastix time they know which is ‘their’ bed. When their owners are in Bess positions herself wherever she can be nearest to them (mostly so she can see whether they’re likely to give her food any time soon as she really is a hungry horris!). She’s ever so gentle with the children and very much enjoys their company.